This page gives details of the modules that are available for the M.Sc. in Radiometrics. Follow the link to get a summary of each available module. The modules can lead to various qualifications. There is also a link to the various facilities in the Department of Physics and general information. Further details can be obtained from the course director. M.Sc. modules currently scheduled are listed here with the module timetable for full time students linked here. A wide range of industry in the U.K. and overseas increasingly needs people trained in Radiometrics - for example in the nuclear power industry, medicine, environmental organisations, the oil and mining industries and organisations who are responsible for health and safety. The M.Sc. course is aimed at those wishing to pursue a career in any part of industry which involves radiation or the use of radiation detectors. It is also aimed at those already in employment, and using radiometric techniques, who wish to gain more training or advance to a new qualification. The course covers basic radiation principles, the use of detection systems and associated instrumentation, applications and modelling techniques. Since its foundation in 1881 the University of Liverpool has spearheaded innovative research in science and technology and, more recently, the Department of Physics has twice been awarded the highest grade of excellent in the national research assessment process. The Department's research groups have an international reputation in the fields of particle physics, nuclear physics, surface physics, condensed matter physics and biophysics. As a result they have considerable expertise in the development of radiation detection systems and it is this expertise that provides the basis for both the M.Sc. in Radiometrics: Instrumentation and Modelling and the Postgraduate Certificate in Radiometrics. This is a modular M.Sc. course aimed at an understanding of radiation detectors and their uses. An M.Sc. can be obtained by accumulating 180 CATS (Credit accumulation transfer system) points in approved modules subject to the rules laid out below. The course can be taken full time over a period of one year or part time over a period of up to six years. The modules available are a mixture of taught modules (lectures and practical work), dissertations and a project. There are also two other qualifications that can be obtained based on the same range of modules. These are the Postgraduate Diploma (120 CATS points) and the Postgraduate Certificate (60 CATS points). A complete list of the modules and the available CATS points is given in table 1. The course structure detailing that combinations of modules allowed for the various qualifications is given in table 2. Syllabuses of the modules and the timetable for their delivery are given in the annex. The foundation and basic modules are taught, with the teaching being timetabled over a 5 day period (Monday to Friday in a given week). A detailed timetable is available for each module stating when the lecture and practical sessions will take place. Modules commence at 13-00 on Mondays. On Friday afternoon a one hour examination takes place for the module being taught that week. The applied, dissertation and project modules are completed in the student's own time. The student has to schedule the work to produce the report by the agreed deadline. The applied modules all follow basic modules. At the end of each basic module the topic for the applied modules will be agreed between the student and the module tutor. There will also be an agreed timetable for completion of the module. The topics for the dissertation modules (PHYS842 and PHYS843) will be agreed between the student and the course director once the taught basic modules have been completed. For full time students the topic for the project will be agreed with the courses director in March or April of the academic year. The project will normally take place between April and August of each academic year. For part time students the project topic will normally be based on work that is being carried out at their place of work. For these students the project topic will be agreed once they have completed 50% of the basic module requirement. The foundation and basic modules are assessed by a one hour examination on the Friday afternoon of the module and the continuous assessment during the module. The relative weighting of these two elements is 1 to 2. All other modules are assessed 100% by written report or dissertation. This will be based on the assessment carried out by two examiners. All modules must be passed. The pass mark for each module is 50%. The University compensation rules can apply for to up to two modules whose marks are between 40% and 50%. Students who obtain an average mark of 70% or above will be awarded a mark of distinction. If a student fails a particular module then the work may be resubmitted or the module taken again at the earliest opportunity. All work must be handed in to the examiners by an agreed date in September each year (normally September 10th) in order for the marking to be completed before the meeting of the Board of Examiners which takes place in early October. Each student will be briefed on safety at the start of their course and issued with the Department of Physics Safety manual. All areas where experimental measurements are made with radioactive sources have local rules. Students must make themselves familiar with these rules and follow them at all times. An extract of these rules will be included in the notes for all courses. The Director of Radiometrics studies is Professor P J Nolan, all questions about the Radiometrics courses should be addressed to the Director in the first instance. The Head of the Department of Physics is Professor P J Nolan. The Department of Physics Laboratory Manager and Safety Officer is Mr D W Gifford. The Department of Physics Radiation Protection Adviser is Dr M A Houlden. The Board of Studies in Physics is responsible to the University for the Radiometrics courses. The Department of Physics Postgraduate Student-Staff committee covers this course. The Department has a well equipped Radiometrics Laboratory which is used for both courses. This is equipped with a wide range of gas filled, solid state and scintillation detectors for gammas, betas, alphas and neutrons together with the necessary instrumentation including PC based data collection systems. 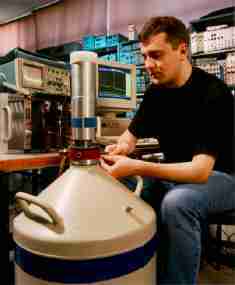 A wide range of sources are available including those needed for X-ray fluorescence, neutron activation and Mössbauer. For the associated project work this equipment can be supplemented by a correlation table with a vacuum system, a beta ray spectrometer and a direct reading Radon detection facility. During the project work M.Sc students will have access to the Department's extensive and well equipped research laboratories. These include those used for the development of detectors and detection systems for the EXOGAM and EUROBALL gamma ray detectors; detection systems for particle physics experiments using the Large Hadron Collider at CERN and the b-factory at SLAC. The Department also has a well equipped environmental Radiometrics laboratory which has an international reputation for its 210Pb dating work. 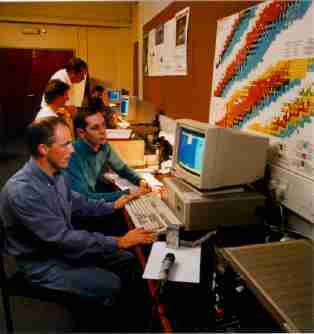 The Radiometrics Laboratory is equipped with a wide range of personal computers. The research laboratories have computer systems based on multi-user UNIX machines. In addition students have access to the university's computer network which is based on clusters of PC's and UNIX workstations. Overseas students are welcome on this course. However they should seek to provide their own funding. Studentships are available for the full time one year M.Sc course to those having a good honours degree. Liverpool is one of Europe's major student cities. The University has almost 12,000 students including 1,900 postgraduate students and is situated about 10 minutes walk from the city centre. A wide range of accommodation is available on or near the campus with over 1,000 self catering places available. The Welfare and Accommodation office can also assist in finding private sector accommodation off-site. The University provides a complete range of facilities for students many of which are based in the newly refurbished Student Services Centre on the campus. *	For those without an Honours degree in Physics. May be waived for others at the discretion of the Director of Studies. Aim:	To cover the background basic Atomic and Nuclear Physics necessary for later modules. Simple atomic structure, electron shells. Nature of interactions of radiation with matter. Interaction of alphas and heavy ions, rate of energy loss and range. Interaction of betas, range, absorption and backscatter. Interaction of gamma- and X-rays, photoelectric and Compton effects, pair production. Interaction of neutrons, slow and fast neutrons. Simple nuclear structure, nuclear shells. Nuclear stability and radioactive decay. Origins of decays involving alpha, beta, gamma, prompt and delayed neutrons, spontaneous fission, X-rays. Radioactivity units and energies. Radionuclide production processes, activation, fission, reactions. Parent-daughter relationships. Aim:	To briefly cover the principles involved in a wide range of detectors. Emphasis on the practical use of examples of all types of detectors. A model detector: charge production, charge collection, plateau. Pulse and mode current. Spectrometry and energy resolution. Efficiency of detection and dead time. Gas detectors: ion chambers, proportional counter and GM-counter. Scintillation detectors: Organic materials; liquid scintillation, plastic scintillators. Inorganic materials: NaI(Tl), CsI(Tl), ZnS, BGO. Semi-conductor detectors: Band structure, n and p type material. Ge detectors for gamma and X-rays. Si detectors for alpha, heavy ions. New materials CdTe and CdZnTe. Neutron detectors: Nuclear reactions, 10B, 6Li, 3He, fission. Self-powered detectors. Neutron interrogation, Cerenkov detectors, photographic methods, track detectors, thermoluminescence, mass spectrometry. Aim: to give some basic rules for modelling the performance of a detector. To compare the results of a model with experimental measurements. Introduction to QBASIC programming. Examples of some random processes described by the RND function using computer graphics, e.g. tossing coins, dice throwing. Working programmes will be provided at this stage and students will be initially encouraged to run them for certain cases and then modify the programmes for other examples. Physical examples of random processes in physics will be discussed and the students guided towards methods of modelling these processes, e.g. radioactive decay, molecular motion in gases. Students will be required to write their own programmes to model (a) the radioactive decay law, (b) obtain the mean free path of a gas molecule. The mathematical descriptions of gamma-ray interactions with matter (a) the photo-electric effect, (b) Compton scattering, (c) pair production will be discussed. The efficiency response of a Ge detector will be modelled for each of these processes in turn. All three processes will be combined to determine the overall efficiency response of a Ge detector to different energy gamma-rays. The actual efficiency response of a Ge detector for different energy gamma-rays will be measured and improved with the output of the modelling programme. Aim:	To give a practical and theoretical knowledge of all aspects of high resolution gamma-spectrometry using germanium detectors. Radioactive decay and the origin of gamma radiation and X-radiation; sources and quantities of radionuclides. Interaction of gamma radiation with matter. Features of a gamma spectrum. Germanium detectors: semi-conductors and mechanisms, types of detector available, detector specification (resolution, efficiency, peak to Compton ratio). Pulse processing; pulse types;pre-amp, unipolar, bipolar, gated integrator; impedance. Preamplifiers: resistive feedback and transistor reset. Linear amplifiers: pole-zero cancellation, baseline restoration, pile up rejection. ADC function: differential and integral linearity; conversion gain and resolution; Wilkinson and successive approximation ADCs; system dead time and dead time correction methods. Aim:	To give a practical and theoretical knowledge of gamma ray detection using scintillation, semiconductor and gas detectors. Interaction of gamma rays with material (solid and gas); photoelectric effect, Compton scattering, pair production. Scintillation principles, types of scintillator, scintillation mechanisms, organic molecules, fluorescence and phosphorescence, quenching, inorganic scintillators, band structure and activators. Types and properties of organic and inorganic scintillators. Light collection and photoelectron production. Photomultiplier tubes; basic elements, photocathodes, electron multiplication. Spectroscopy with scintillators. Properties of spectrometers including resolution, linearity, gain stability and efficiency. Arrays of scintillation detectors, whole body, PET and CAT scanners. Semiconductor detectors; types of semiconductor (silicon, germanium, cadmium telluride cadmium zinc telluride etc.). Different types of detector geometry; planar, coaxial. High resolution spectroscopy for X-rays and gamma-rays. Ion chambers, use for spectrometry, nuclide standardisation and dosemeters. Proportional counters as X-ray spectrometers. Fundamentals of Geiger-Müller detectors; use in industry and the laboratory. Special systems with low background. Aim:	To give a practical and theoretical knowledge of the identification and measurement of alpha particles using silicon detectors. The origin of alpha particles; an outline of alpha decay; parent/daughter relationships. The natural decay series. The production of transuranics in reactors and accelerators; the preparation of alpha-emitting standards. The properties of alpha particles and their absorption in solids, liquids and gases. Detectors for measuring the energy of alphas and other heavy particles; ion chambers and silicon detectors. Recoil effects and detector degradation; geometry effects and energy resolution. Measuring the area of alpha peaks. Identification of unknowns. Choice of isotopic standard. Sampling strategy; sample preparation and dissolution; examples of chemical and ion exchange procedures for the separation of Th, U, Pu, Am, and other actinides. Methods of source preparation. Aim:	To give a practical and theoretical knowledge of neutrons, their interaction with materials and their detection. The nature and origin of neutrons, interaction of neutrons with matter. BF3 proportional counters; fundamentals, wall effects, boron lined detectors. 3He counters; fundamentals and use for spectrometry. Fission chambers. 6Li scintillation detectors. Fast neutron detection and spectrometry. Self-powered neutron detectors. Neutron detectors for reactor instrumentation. The modelling uses the MCNP to investigate the performance of 3He detectors and to gain an understanding of their operational parameters (pressure, size etc). Results are compared to experiment. The effects of moderation, scattering and collimation are then investigated in the model. Aim:	To give a practical and theoretical knowledge of the basic electronics and electronic instrumentation used in nuclear measurements. An introduction to basic electronics and circuits: Pulse processing, cable properties, cable accessories: Detector capacitance and noise: Pulse shaping, differentiating and integrating circuits, Gaussian shaping, pole zero and baseline restoration: Instrument standards, NIM, CAMAC etc: Pulse processing units, pulse counting systems, pulse height analysis systems, pulse timing systems, coincidence measurements, multichannel pulse analysis. Count rates, dead time, system limitation. Aim:	To give a theoretical and practical understanding of the statistical principles involved with radiation detectors. To give some practical experience of data collection and analysis systems. Experimental errors; random and systematic errors; distributions, mean, variance; combining errors. Probability and Statistics: probability, rules of probability; statistics. Distributions; Binomial, Poisson, Gaussian, Error Matrix. Parameter Fitting; least squares, hypothesis testing; Chi-squared analysis t-test. Monte Carlo Methods; introduction, simple examples. Quality assurance: introduction, simple examples. Use of data collection and analysis systems. Aim:	To cover the basic principles involved in radiation protection and dosimetry including biological aspects of being in a radiation environment. Radiation dosimetry: quantities and units, measurement of exposure, LET, dose calculations, RBE, chemical and biological effects. Radiation protection criteria: ICRP, HSE, HMIP, NRPB; derived and authorised limits; protection systems: distance, time and shielding. Monitoring systems and dosimetry: film badges, TLD, ion chambers; reference man, ALI, DAC; dosimetric models: lung, gastrointestinal etc. Waste disposal: open and closed sources; high and intermediate level; low level. Effects of radiation: acute radiation syndrome, delayed somatic effects, genetic effects, dose-response relationships: stochastic/non-stochastic. Perceived risk versus actual risk: basis of risk calculations, comparison of risks. Regulatory control and safe working practices in radiochemistry laboratories. Parent-daughter relationships, isotope generators, measurement of half-lives. Radiotracers, preparation of radioactive sources, choice of counter. Isotope effects in chemistry, isotope dilution analysis, substoichiometric analysis, inverse isotope dilution analysis, radioimmunoasay. Activation reactions and activation analysis. Chemical reactions following nuclear transformations. Nuclear dating, radiocarbon, tritium, U-Pb, Th-Pb, Rb-Sr, K-Ar, fission track dating. The basics of alpha spectrometry, detection systems. Aim:	To cover environmental uses of radiation detectors and the impact of low levels of radiation on the environment. Radioactivity, origins and effects. Natural and man-made sources. Environmental transport models, atmospheric properties, radioactivity in the atmosphere. The food chain from soil to humans. Transport in aquatic systems. Natural radioactivity. Examples including fertilisers, building materials, fossil fuels etc. Radon; its measurement and hazards. Use of radioactivity for dating. Nuclear fuels and reprocessing, discharges into the environment. Low level waste management, storage and disposal. Low level radiation techniques, systems and limitations. Gamma and alpha based counting systems. Characterisation of backgrounds, shielding. Use of detection systems in several applications. There will be a visit to an environmental site to collect samples for later analysis. Aim:	To give a broad appreciation of the origins, statutory controls, and disposal routes for radioactive waste in the UK and worldwide. To give a detailed knowledge of the techniques used in identifying and quantifying radioactivity in waste streams prior to disposal. Sources of waste; including medicine, research laboratory, reactor operations and plant decommissioning. Quantities of waste in the UK and elsewhere. The legal framework; waste categories and regulatory control on disposal, de minimis quantities. Disposal options: shallow burial, engineered surface sites and deep repositories; nuclear incineration and other novel processes. Mechanisms of transport and routes from geological disposal sites back to the biosphere. Vitrification. Detailed consideration of current Nirex plans. Measurement and characterisation of wastes: spent fuel, transuranic and other reprocessing wastes, decommissioning wastes. Detailed consideration of systems using neutrons; both as spontaneous fission indicators and in neutron interrogation techniques (shufflers and differential die-away). Detailed consideration of systems using gamma spectrometry, both low and high resolution; the problems of absorption and inhomogeneity. The problem of economically estimating alpha emitters and X-ray emitters in bulk material. There will be a visit to a nuclear site to see specialised measuring equipment in action. Aim:	To give a basic understanding of how the effect of shielding can be calculated and to investigate how radioactivity can be monitored through shielding. Review of the interaction of radiation with materials (neutrons and gamma-rays). Properties of materials used to shield radiation. Calculation of the effect of a simple shielding arrangement and comparison with experiments. Measurements and calculation of radiation strength with and without shielding. Set up a model of shielding in a more complex geometry and prediction of results. Experimental check of predictions and improvement of the model. Considerations of monitoring radiation remote from the source, effects of shielding and scattering. Aim:	to provide training in system design and optimisation using a wide range of radiometric techniques. Basic properties of radiation: alpha, beta, gamma, neutrons and charged particles. Interactions of radiation with materials. Brief summary of detectors and detection systems available for various radiations including their advantages and disadvantages. Data collection and analysis techniques available. Preparation of the design specification of the instrument concentrating on the contrast between necessary and desirable features. Choice of the optimum instrument for the task including cost effectiveness. Prediction of the response of the instrument to the problem using simple modelling techniques. Measurements with the instrumentation and comparison with the specification. Quality assurance aspects of the system performance. Identification of any deficiencies in the system and possible solutions. The discussion periods and practical work will be centred around the systems necessary to solve three different problems. Further topics in high resolution gamma spectrometry based on the knowledge gained in PHYS804, additional work with industry standard computer programmes and an detailed literature search on the properties of germanium detectors. The written report will cover this work and the solution to an agreed high resolution gamma spectrometry problem involving the use of germanium detectors. Further topics in gamma rays: detection and modelling based on the knowledge gained in PHYS805 and an information search. This will concentrate on applications including medical and industrial uses. The written report, which will be assessed by two examiners, will cover this work and the solution to an agreed applied Radiometrics problem involving the use of gamma-ray detectors. Further topics in alpha spectrometry based on the knowledge gained in PHYS806 and a detailed literature survey of the properties of silicon detectors for alpha detection. This will concentrate on finding solutions to applied problems in the environmental and radioactive waste areas. The written report will cover this work and the solution to an agreed applied alpha spectrometry problem. Further topics in the use of neutron detectors based on the knowledge gained in PHYS807 and an information search on the practical characteristics of commercially available neutron detectors. This will concentrate on finding solutions to applied problems in the nuclear industry. The written report will cover this work and the solution to an agreed applied neutron detection problem including modelling the situation. Further topics in the use of nuclear instrumentation based on the knowledge gained in PHYS808 and a detailed survey of the specifications and use of several electronic modules. This will concentrate on finding the optimum instrumentation to solve particular problems (e.g. high counts rate, low background etc). The written report will cover this work and discuss the solution to the instrumentation for the detectors in a laboratory test for a radiation detection system. Further topics in the use of statistical techniques based on the knowledge gained in PHYS809 and a detailed survey of the needs of low background systems. This will concentrate on finding the optimum conditions for determining the minimum detectable activity in a system and on how it can be improved. The written report will cover this work and discuss the solution to the methods that could be used for improving the minimum detectable activity in a particular gamma ray detection system. Further topics in the application of radiation protection rules and the use of dosimetry based on the knowledge gained in PHYS810 and a detailed survey of the needs in several different situations. The written report will cover this work and discuss two different situations from the point of view of a health physicist including a discussion of the appropriate dosimetry to use. Further topics in the application of radiochemistry using the knowledge gained in PHYS811 and a detailed investigation of advanced separation techniques and the interfacing of standard and new methodologies. The written report will cover this work and discuss possibilities of the chemical effects of nuclear transformations. Further topics on environmental aspect based on the knowledge gained in PHYS812 and a detailed survey using available data of environmental radiation in the UK. This will concentrate on finding the necessary information on the radionuclides present so that the detection systems needed can be specified. The written report will cover this work and discuss the instrumentation needed to operate a laboratory to measure environmental levels of radiation over a wide range of applications. Further topics on radioactive waste based on the knowledge gained in PHYS813 and a detailed survey of the problems of radioactive waste disposal in the UK. This will concentrate on finding the necessary information on the radionuclides present and their activities so that the detection systems needed can be specified to monitor the disposal. The written report will cover this work and discuss the instrumentation needed to determine the activity of samples leaving a nuclear plant so that the correct disposal procedures are used. Further modelling work on a particular applied problem. The problem will be agreed depending on which modules the student has taken previously. The work will involve defining a complete model of a particular situation from the nuclear industry and then using the MCNP code to produce predictions. The written report will be in the form of a report on the problems, the predictions and recommendations for further work. Further more detailed work on radiometric systems. The students will be asked to complete a detailed design and technical specification for the instrumentation needed to solve two different problems. This will require and extensive literature survey to find the specifications of the proposed instrumentation and some computational work to justify the use of the instrumentation proposed. A practical project for the M.Sc. Degree based on a Radiometrics topic. A dissertation based on a Radiometrics topic for the Pg Diploma. The dissertation, which will be assessed by two examiners, will not involve practical work with detectors, but will include some computational work. A dissertation based on a Radiometrics topic for the M.Sc. The dissertation, which will be assessed by two examiners, will not involve practical work with detectors, but may include some computational work. © University of Liverpool | Disclaimer.